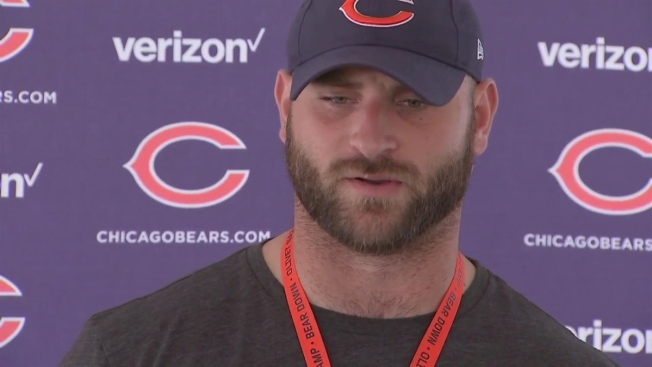 Chicago Bears lineman Kyle Long spoke to reporters about the violence in Charlottesville, VA, following the team's practice at training camp. After protests turned violent in Charlottesville, VA on Saturday, Chicago Bears offensive lineman Kyle Long spoke out on the situation in his hometown. “Injustice in the world we live in is a threat to the freedoms we have,” he said. “It’s a small percentage of people involved who are blatantly in the wrong, and we need to do our best as good folks to continue to outnumber them and express our opinions and act accordingly when given the opportunity to. “My prayers go to families who have lost folks and who are going through (this),” he added. One woman was killed when a car drove through a crowd of counter-protesters on Saturday, and two Virginia state police officers were killed when their helicopter crashed just miles from the city. Wow... to think that failure to condemn white supremacy is a form of political self preservation in America right now.... tough day. When asked about his brother’s forceful rebuttal of the president, Long steered clear of criticizing anyone, but praised his brother for being candid about his feelings. “Chris does a really good job of articulating his views, whether socially or politically,” he said. “I try to stay out of this stuff, but the one thing I can say is that Charlottesville families who were affected are in our thoughts and prayers.